With over 6 decades of industry expertise, this privately held manufacturer continues dedication to the highest quality built product and personalized customer support. PDC Spas, Plastic Development Co., Inc., located in the heart of the Northeast, proudly employs Pennsylvania craftsmen to design, develop and build each and every unit, from the beginning to the end. 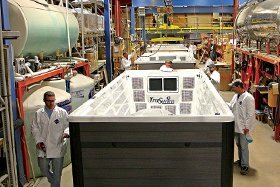 PDC Spas stands out in the crowd of hot tub builders who manufactures in the USA. Even the most well known names in the industry manufacture in Mexico. If you're looking to support American Made, PDC Spas is your choice. PDC Spas confidently stands behind their unsurpassed 35 year warranty, having over 60 years experience in building products that stand the test of time. Avoid the confusing terminology from other manufacturers of a “lifetime” warranty. Lifetime does not mean lifetime, but rather a length of time determined by the State. In PA, lifetime warranty is 7 years. Because we exist in a global market, be aware of products imported from China and the difficulty of exercising your warranty rights. Buy USA made with confidence. Factory trained professionals are on staff during regular business hours personally taking your questions until complete satisfaction is met. All phones are answered live, directing customers to the right support for quick solutions. Call toll free, 800.451.1420 to see for yourself. PDC Spas continues to lead in exceptional hydrotherapy innovation across the globe. Not only in the hot tub and swim spa industry, but professional sports arenas and our military have recognized our quality and now reap the benefits of warm water massage and exercise. Well known teams such as Kansas City Royals™, Pittsburgh Steelers™ and Dallas Cowboys™ have improved their game with the help of PDC Spas products. Currently, PDC Spas is proudly in development with the Navy Seals furthering their training with the aid of effective aquatic exercise utilizing TruSwim™ technology.